The media marketplace is in the middle of an unprecedented paradigm shift. New Internet-based media companies are successfully leveraging innovative content creation and delivery tools to challenge traditional media outlets for viewership and advertising revenue. The tight control that traditional media used to have over what got produced and what got viewed is unravelling. The gate is unlocked and now anyone with access to a computer and the Internet can create and deliver decent-quality content. The result: traditional media companies are losing market share and advertising revenue to non-traditional media players. Media is becoming unbundled from the closely-packaged offerings of the past, allowing users to take their media with them and watch what they want when they want. Considering that podcasting has been around for less than 3 years, the rate of change is astonishing. Big media companies are stumbling, trying to figure out if the new media models are simply a passing fad or a serious competitive threat. The majority of these companies are not operationally nimble. With bloated overheads and competing internal interests, many will fail to react in a timely manner. The few that have visionary leaders will view the changing landscape as offering new opportunities and will proactively reshape their companies. Fortunes are at stake. Some traditional media outlets will falter; some Internet-based new media companies will prosper. The companies that succeed will have the bold vision, innovative prowess, marketing savvy, and proactive leadership to guide them through the uncertainty. But key questions remain. What is the new media business model? How will revenue be generated? Whereas the new media paradigm is powerful, there is a lack of clear vision on how this burgeoning opportunity can best be monetized. 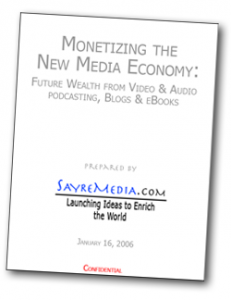 SayreMedia sees the path clearly and has created a report detailing the challenges, opportunities, and timelines in monetizing the new media economy. 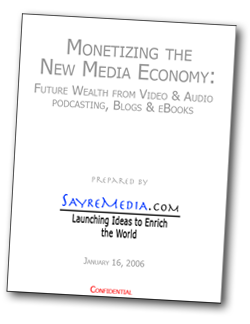 This confidential report is available to our new-media friends who are seriously interested in working with SayreMedia in forging the new media economy.